Ana Mardoll's Ramblings: Author Interview: Max Billington on "The Libertines Motorcycle Club"
Author Interview: Max Billington on "The Libertines Motorcycle Club"
Ana: Today we have Max Billington introducing their novel, The Libertines Motorcycle Club: An Outlaw Is Born. I haven't read this book myself, but Max was kind enough to agree to guest blog about their book to any readers who might be interested in the subject. Max, how would you describe your novel to your prospective readers? In broad terms, what is your novel about? Max: Thanks Ana. 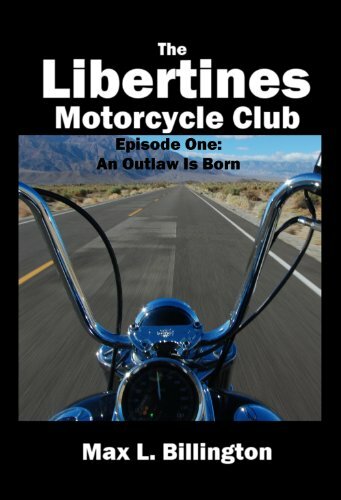 The Libertines Motorcycle Club tells the story of a regular guy named Connor who goes from being an everyday white collar nobody to an outlaw biker. The novel details the struggles that he encounters in his drastic lifestyle change. Max: I would like to think that my novel has two underlying themes. The first being, a seemingly small decision in your life can cause drastic change, and secondly, never underestimate what you are capable of. Max: Actually, I never had any intentions of writing a novel. I belong to a family motorcycle riding club, of which I am the secretary and the president of our club challenged me to write a book after I had sent several funny emails and very, very short stories about rides we went on. Max: There are quite a few outlaw biker books out there. Some are fiction, but most are either true stories or an account of what supposedly goes on behind closed doors of a motorcycle club (MC). For instance, Sonny Barger, who was one of the founding members of the Hells Angels, wrote a autobiographical book called, "Hell’s Angel: The life and Times of Sonny Barger and the Hells Angels Motorcycle Club." The book reads similar to his book, but in my novel, the main character is joining an established MC. Ana: Is this your first or only published work, or have you published other novels? Do you have any more novels planned, either as a follow-up to this one, or as a completely different novel or genre? Max: This is my first novel. When I began writing the book, I only planned on writing one book. Then, as the story began to develop in my head, my motorcycle riding club lost a member. This actually caused me to stop writing for a while. When I got back to writing, I started making the story more and more complex and realized that I wanted to end this one with a cliffhanger. As I sit right now, I am hoping to have the sequel done by this time next year. Max: You can purchase the book from Amazon.com in paperback or Kindle format. The best way to find out any news about the book would be to like our Facebook page. Ana: Thank you, Max. I understand you have the first chapter of your novel available as an excerpt for interested readers? And is there anything else you wish to add for our readers? Max: Thank you, Ana. I appreciate it. Your readers can access the first chapter online through the Amazon "Try It Free" sample option. I hope it gets you hooked so you want to read the rest. Oh, and fair warning, it does contain foul language! I mean, they're bikers. What else would you expect? I purchased this book in Kindle format and could not stop. Max Billington does a GREAT job drawing the reader into this story. I highly recommend reading this book. I was also surprised to find out that this is Mr. billing tons first novel. I will look forward to reading more of his work. GREAT BOOK Mr. Billington . I am already looking forward to episode 2. It's a good story, the ending is a bit messed up, but it's a biker tale. I would suggest the author proff...pruf...proof read before publishing. Don't get me wrong, its a great first book and I will buy any others you right...rite...write ! its almost hard to argue with you (not that I actually would ωant to…HаHa). Υоu dеfinitely put a fresh spin оn a topіc whіch hаs beеn discussed for years. needѕ a lοt more аttention. I'll probably be returning to see more, thanks for the info!